ERNiCu-7 is a commonly used filler metal in the welding of Monel 400 piping materials. It is designated as UNS N04060, also known as Monel 60 with nominal composition of 65Ni-30Cu-3Mn-2Ti. The ERNiCu-7 bare welding electrode/ rod can be used in the GTAW (TIG), GMAW, SAW and PAW processes for the welding of Monel 400 (UNS N04400) materials of ASTM B127(plate), ASTM B163(seamless tube), ASTM B165(seamless pipe), and ASTM B164(rod, bar & wire). Titanium contents are added to control porosity with these welding processes. The weld metal has properties similar to those of Monel 400. It has good strength and resists corrosion in many media, including seawater, salt, and reducing acids. 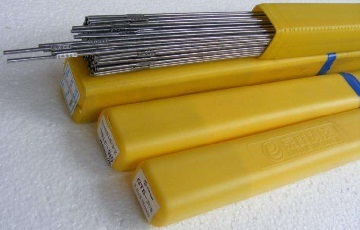 ERNiCu-7 welding rods for the TIG welding process of Monel 400. 2.4mm(O.D) x 915mm(Length). *The tabulated values are furnished in accordance with AWS A5.14. The mechanical properties of the weld metal may be influenced by a variety of factors in the welding process. These variables include current, voltage, welding speed, gas mixture, dexterity of the welder, and base metal chemical composition, etc. Typically, the minimum weld metal tensile strength for ERNiCu-7 is 70 ksi [380 MPa]. It minimum elongation value is 30%. *The P-Number of base metal Monel 400(UNS N04400) is 42. 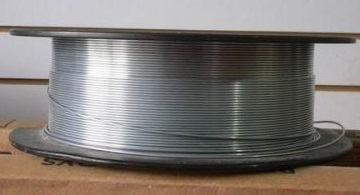 AWS A5.14 ERNiCu-7 welding wire in spool package. *The length of cut-straight length shall be 900 mm ± 2%. *Diameter tolerance for cut straight lengths(mm):+0.01, -0.07; Diameter tolerance for spools(mm):+0.01, -0.04.